To celebrate the 150th birthday of Laura Ingalls Wilder in 2017, the South Dakota State Historical Society will release a new book on the writer’s legacy. In 2014, the South Dakota Historical Society Press released Wilder’s “Pioneer Girl: The Annotated Autobiography,” edited by Pamela Smith Hill, which became a national bestseller. The new book, “Pioneer Girl Perspectives: Exploring Laura Ingalls Wilder,” edited by Nancy Tystad Koupal, will bring together writers from across the continent to explore the impact that “Pioneer Girl: The Annotated Autobiography” made on our understanding of one of America’s most iconic authors. Sales for “Pioneer Girl: The Annotated Autobiography” shot past original expectations, and the book is now in its ninth printing with 165,000 copies in print. A contract for Japanese translation rights is underway between the South Dakota Historical Society Press and Taishukan Publishing. Preorders for “Pioneer Girl Perspectives: Exploring Laura Ingalls Wilder” will open in November 2016; the book will be available in the spring of 2017. Wilder was born Feb. 7, 1867, and died on Feb. 10, 1957. More book details will be released by the Pioneer Girl Project on its website: https://pioneergirlproject.org/. 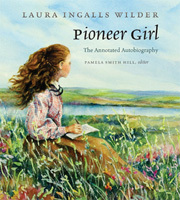 “Pioneer Girl: The Annotated Autobiography” is available for $39.95 plus shipping and tax through sdhspress.com and the Heritage Store.